Dermefface FX7™ Scar Reduction Therapy has been scientifically formulated with a series of clinically proven active ingredients that fade scars from acne, injury, illness, surgery and more. Skin aging around your scarred areas is reduced. Redness and discoloration fade. And flakiness and itching should no longer be a problem thanks to the deep, penetrating moisturization. At a 10% concentration as included in Dermefface FX7™, the active Symglucan has been clinically proven to significantly speed wound healing – reducing the appearance of scars as well as deep skin wrinkles. Clinical Trial #2 – Reduced Deep Wrinkles By 17% In Just 8 Weeks! Symglucan has also been proven in clinical studies to measurably improve skin's moisture (20% improved), firmness (16% improved), elasticity (10% improved) and smoothness (11% improved). As well, it has also been proven in clinical trials to protect skin against further UV sun damage, promote collagen production for more youthful looking and feeling skin, and reduce deep wrinkles. Noticeable Improvements In Their Skin! 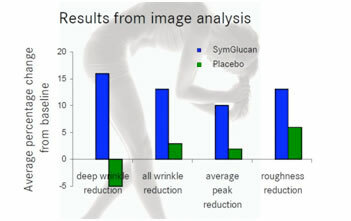 Source: SymGlucan Clinical Study by Symrise. This 100% natural plant-derived ingredient is a highly effective moisturizer that works by binding itself to your skin's keratin and then attracting and locking in moisture. It can only be removed by your skin's natural process of shedding dead skin cells, which is what makes it such an intensely effective moisturizing treatment even under the driest of conditions! 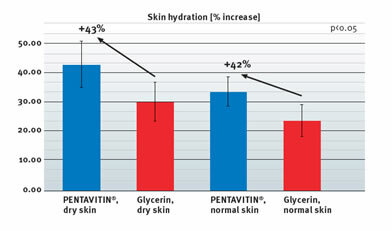 A skin hydration study confirmed that 5% Pentavin outperforms 6% glycerin by nearly 50% on both dry and normal skin after 14 days of application. Also known as Provitamin B5, it has been proven in various studies to have a positive influence on the healing and regrowth of skin, with significant anti-inflammatory effects. This active ingredient is obtained from purified Vervain and is rich in peptides. It works by reinforcing the skin barrier function while helping to maintain a healthy turnover of skin cells and moisturization. After 56 days of twice daily application, volunteers reported smoother skin, reduced crow's feet, and reduced depth of wrinkles. "78% Of Trial Participants Saw A Noticeable Increase In Skin Smoothness!" Pro-Coll-One+ can boost the synthesis of collagen I (the body's most common form of collagen) in healthy human fibroblasts by as much as 1190%. In a 56-day study, participants applied the ingredient at a 2% concentration twice daily. The surface roughness of skin was reduced by an average of almost 10 percent. Seventy-eight percent of participants cited a noticeable difference in the smoothness of their skin. Known to consolidate the “dermal mattress” (the dermal layer of the skin), Pro-Coll-One+ has quickly become the new benchmark ingredient in collagen synthesis. Since scars are injuries that occur at the dermal level, it is this dermal restructuring that is required for healing. With the cellular matrix restored, the body can repair the indentation and unevenness caused by scarring. 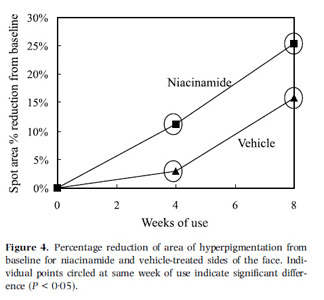 In clinical studies, Niacinamide has been show to significantly reduce hyperpigmentation and increase skin lightness with 4 weeks use (when compared to a control moisturizer without niacinamide). It's a biologically active form of Vitamin B3 that's involved in over 200 enzymatic reactions. It's well tolerated by the skin and doesn't cause flushing like other forms of B vitamin. 89% Of Participants Reported A 'Noticeable' Or 'Significant' Decrease In Hyperpigmentation! 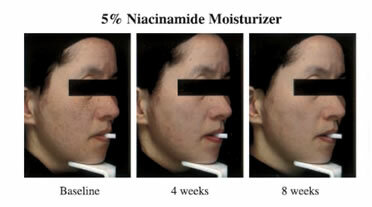 Reduced Hyperpigmentation By 25% Over 8 Weeks! In this study 120 Japanese women aged 18-30 with a moderate to deep facial tan were enrolled and assigned to one of three groups. Three products were tested: (1) vehicle moisturizer, (2) ultraviolet B/UVA sunscreen in the vehicle moisturizer with an SPF 15, and (3) a 2% niacinamide + UVB/UVA sunscreen in the vehicle moisturizer. Participants were randomly assigned to apply one product to the left side of their face, and one product to the right side of their face. Also known as vitamin U, Allantoin has been used to treat dry and damaged skin since the 16th century. Allantoin is a moisturizer and a kerolytic -- which means it softens the keratin in the skin (the key structural protein in the epidermis), allowing skin to heal more quickly and to absorb moisture more effectively. Known for its anti-inflammatory effects, Allantoin is often used to stimulate regeneration of healthy skin cell tissues. At the same time, it acts as a chemical “debrider,” which means it helps slough off dead and damaged skin cells and tissues. Together, these actions help speed the general healing of the skin. In cases of mechanical and chemical irritation, significant decrease of skin water loss and redness of the skin after treatment with a cream containing 0.5 % Allantoin has been observed. 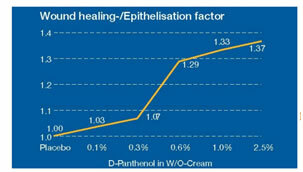 After UV irritation, the redness decreases with a cream containing 0.5 % Allantoin. The extract of this small perennial plant has a long history of use for treating and healing wounds. Contains plant pigments called anthocyanosides that have powerful antioxidant properties, as well as vitamin C. Together they scavenge free radicals and help skin maintain elasticity with a healthy collagen and elastin matrix. Often used in the treatment of vascular and vision disorders, bilberry extract is known to improve blood circulation. The extract of the acai berry helps prevent the erosion of the skin's protective coating while helping to reduce the appearance of fine lines and wrinkles. It's also useful for healing small skin wounds. High in omega-3, 6, & 9 as well as fatty acids, B-complex vitamins, Vitamin C, minerals and amino acids.... it has extremely high antioxidant value and is an excellent moisturizer and healing agent for dry or cracked skin. With significant polysaccharides, 19 amino acids, 21 trace minerals, and vitamins (C, E, B1, B2, B6, & E), Goji has been found to increase cell metabolic function by as much as 20% when applied topically. High in antioxidant activity, goji has also been reported to capture superoxide radicals (between 35-82%). (Wu, SJ. et al, 2004) And this high anti-oxidant activity has been shown to help reduce the effects of skin aging. As well it has been noted to improve skin healing with anti-inflammatory, anti-fungal, and anti-bacterial properties. The maqui berry is from the Patagonia region of South America and has been used to help reverse the aging process for centuries by the natives of Mapuche. Exceptionally high in anti-oxidants, it helps support optimal skin function and healing, with potent anti-inflammatory and anti-bacterial action. Found in North America growing in woodland areas, chokeberries have been a staple in native Indian diets for hundreds of years. More recently they've earned a reputation for being exceptionally high in anti-oxidants; according to one study by NP Nutra, they score higher than almost all other 'superfruits' for antioxidatives. This makes it exceptionally valuable for skin healing and dermal regeneration. This tropical fruit of Southeast Asia is known for being exceptionally high in antioxidants – xanthones in particular – making it excellent for skin healing, with anti-bacterial, anti-fungal, and anti-inflammatory properties. Recent studies have shown it to be high in antioxidants that include catechin, quercetin, kaempferol, and equol -- increasing the production of collagen while offering significant UV sun protection. A study published in the 2005 Journal of Medical Foods found that it had a positive effect on the skin's ability to regenerate itself with increased collagen production. It may also be useful for relieving sun burns, eczema, and psoriasis.